Google Chrome browser has minimalistic user interface allowing maximum screen space for viewing web content. You can increase screen space further by setting auto hide to address bar and menu toolbar at the top of Google Chrome window. New Google Chrome has lot of feature like Instant Pages for quick browsing and so on. 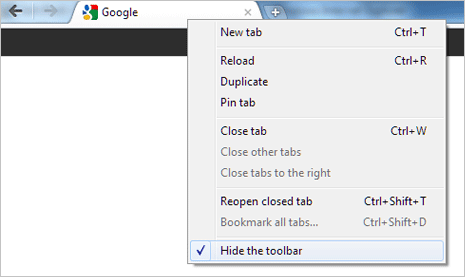 Using ‘Compact Navigation’ option in Google Chrome (13 or above), you can remove or hide address bar and toolbar from Google Chrome. Once you enable and turn on the ‘Compact Navigation’ option, all (extension) buttons displayed on menu toolbar are removed except wrench icon (which is now added to extreme right of the tabs bar). 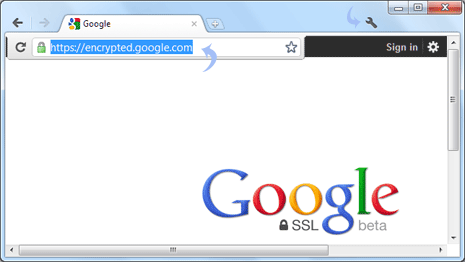 Address bar is removed and you can open floating address bar by clicking any tab in Google Chrome. 1. Launch Google Chrome browser (make sure you update Google Chrome to latest version 13 or above). By default, address bar and menu toolbar will appear at the top part of Chrome window. 2. 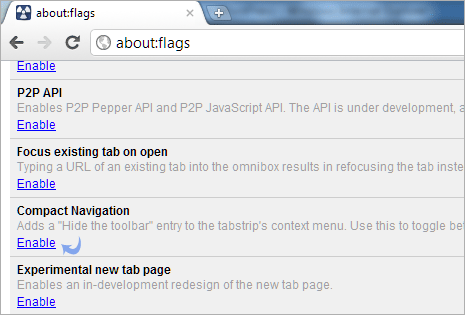 In the address bar type about:flags and then scroll down to the bottom to look for ‘Compact Navigation’ option (Adds a “Hide the toolbar” entry to the tabstrip’s context menu. Use this to toggle between always displaying the toolbar and only opening it as a drop down box as needed). 3. Click Enable under ‘Compact Navigation’ option. Then close and open Google Chrome browser (restart). Then right click on any tab button and click on ‘Hide the toolbar’ option to see compact top part of Chrome window with menu toolbar and address bar missing. 4. Click on tab button area to see floating address bar and to enter website URL for browsing. To access Chrome options, Wrench icon should be visible at right part of the tabs bar for quick access. You can quickly switch back to default look by right clicking any tab button and then unchecking (no tick) “Hide the toolbar” option. You can check this option to get compact look back anytime. If you want to permanently disable this feature, click disable button for ‘Compact Navigation’ option on about:flags page.